The US Environmental Protection Agency (EPA) heeded calls to give state and regional cap-and-trade programs a compliance role in its proposed rules for reducing carbon pollution from existing power plants in the US. But the agency could not find a place for carbon offsets as a compliance mechanism in its proposal. 2 June 2014 | For years, California and nine Northeastern states in the US remained committed to implementing and operating cap-and-trade programs aimed at reducing carbon emissions even in the face of significant political pushback against the use of market-based programs. Those states are in line to reap major rewards for their actions as a federal regulatory proposal to reduce carbon pollution makes plenty of room for cap-and-trade programs. However, they must be able to show they can hit the federal program’s targets without the use of offsets generated by tree planting and other types of projects. On Monday, the US Environmental Protection Agency (EPA) officially released its response to President Barack Obama’s 2013 edict directing the agency to develop rules to reduce carbon pollution from the US power sector. The proposal aims to lower carbon pollution from existing power plants by 30% from 2005 levels by 2030, sets state-specific goals to lower carbon pollution from existing power plants and issues guidelines to help the states develop plans for meeting the goals. The proposal was developed under Section 111(d) of the Clean Air Act, which directs the EPA to set goals and allow states to submit plans to achieve those goals. “It’s the biggest step the Obama administration can take to get significant reductions in the remainder of his term,” said Peter Shattuck, director of market initiatives for NGO Environment Northeast. 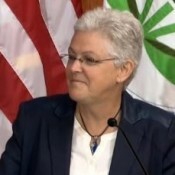 The EPA heeded calls to give states as much room as possible to comply with the regulations, as the guidance includes a number of compliance options, including market-based programs to reduce carbon, investments in existing or new energy efficiency programs or expansion of renewable energy initiatives. States can even implement a carbon tax if they choose, as the EPA is not putting many limitations on the measures that states can use as long as these measures help them meet the reduction goals within the power sector, a senior agency official said. Officials for the Regional Greenhouse Gas Initiative (RGGI), the carbon trading program covering power plants located in nine Northeastern states, have been publicly lobbying for their program to be included as a potential compliance mechanism in the federal rules and that effort appears to have paid off. The EPA explicitly mentioned that the emissions reductions generated by RGGI and California’s cap-and-trade programs would be approved under EPA’s guidelines. The RGGI states applauded EPA’s recognition of regional market-based programs. They also argued that RGGI is a proven, extremely cost-effective model that provides economic benefits and ensures that emissions decrease across the region. “It would have been unthinkable for EPA not to have included existing cap-and-trade programs,” said William Shobe, an economist and professor at the University of Virginia who helped design the original RGGI program. “RGGI has a plan in place for doing more than required” by the EPA. In the US Northeast, nine states – Connecticut, Delaware, Maine, Maryland, Massachusetts, New Hampshire, New York, Rhode Island, and Vermont – have entered RGGI’s second compliance phase. The regional cap-and-trade system originally had 10 members at the start of the program, but New Jersey withdrew at the end of the first compliance period in December 2011. California’s cap-and-trade program is a key element of the state’s plan to comply with its ambitious pledge to reduce its greenhouse gas (GHG) emissions to 1990 levels by 2020, a goal outlined by the state’s Global Warming Solutions Act of 2006 (AB 32). Unlike RGGI, the California program seeks to cap GHG emissions from all major industries, representing about 85% of the state’s emissions. California also has what some observers called the most aggressive renewable energy portfolio standard in the US, with a requirement that 33% of all electricity sold in the state come from renewable sources by 2020. “California is proof positive that states can fashion creative policies that improve their environmental and economic bottom line, and that’s exactly what will be needed to make EPA’s Clean Power Plan a durable and resounding success,” said Derek Walker, Associate Vice President of the US Climate and Energy Program for Environmental Defense Fund. There has been rampant speculation that other states will join forces with California or the RGGI states if those programs were deemed eligible for compliance with the EPA’s proposal. Market observers generally reported seeing major potential for more states to follow the lead of these two programs by implementing their own trading programs or joining forces with California or RGGI. “We fully expect this will provide impetus to many states to consider cap and trade and other market-based tools and could spur a broadening carbon market throughout the country,” said Gary Gero, president of the Climate Action Reserve. “I don’t think we’re going to see it right away, but there are encouraging signs,” Shattuck said, adding that one such positive sign is that the EPA proposal allows states to retain the rights over the allocation of allowances and any revenues generated by the sale of such allowances within their trading programs. Cap and trade is also already a very familiar concept in the power sector, which has previously had to comply with trading programs covering other pollutants such as sulfur dioxide and nitrogen oxides and has been trading allowances under such programs for many years. “That’s one reason the power sector might be more receptive to this than the political rhetoric might suggest,” he said. Programs covering multiple emitting sectors, as California’s program will starting in 2015 when transport fuels are phased into the program, could be approved as long as they achieve the specific targets for electric generating units set for each state, according to the EPA proposal. However, the language of the draft EPA proposal rules out the possibility of using carbon offsets as a compliance mechanism in the proposed regulation. Carbon offsets could continue to exist within state and regional programs, as they do in California and RGGI, and continue to be used to meet state obligations. But states would not be able to count the emission reductions generated by these projects toward the reductions required by EPA in the power sector. “At this point, I don’t see carbon offsets as a compliance mechanism,” Walker said. The exclusion of offsets as a compliance mechanism is unsurprising, given that the Natural Resources Defense Council, in discussing potential compliance options, specifically stated that offsets were not an option. Previous analysis indicated that the language of Section 111(d) would not leave room for measures that do not have a direct impact on the emissions from covered generating units, although carbon market observers were waiting for final word from the EPA on this point. Allowance prices in the RGGI program have been too low to spur development of carbon offsets, but the program does allow afforestation, improved forest management, avoided conversion and reforestation projects. The RGGI program also allows for offsets from four other project types: landfill methane capture and destruction, sulfur hexafluoride reduction in the electricity sector, avoided agricultural methane emissions, and energy-efficient building projects. Given this lack of activity, the inability to use offsets to fulfill EPA’s proposed requirements may not be a critical issue for the RGGI program, experts said. California’s carbon offset program is much more active, with the California Air Resources Board issuing nearly 8.8 million offsets to date under its forestry, livestock and US ozone-depleting substances protocols. The program also allows for urban forestry projects although activity under that protocol has been virtually non-existent while coal mine methane projects were just added to the program in April. And state regulators have pledged to consider adding sector-based international REDD+ (Reduced emissions from deforestation and forest degradation) offsets to the program. The EPA is seeking comments on the rule proposed Monday and the final version will likely see changes. There is no legal deadline for finalizing the regulation, but President Obama has directed that the rule be completed by June 2015 before he leaves office. Steve Zwick contributed to this story.